Full disclosure: I’ve been a fan of JM Guillen’s writing since I first read his dark fantasy novella The Herald of Autumn, and as fellow writers we’ve reviewed and helped get the word out about each other’s books. Yet the reason that I’m so willing and able to do so is simple: Every book of his that I’ve read so far has been SO FRELLING GOOD! I recently finished reading Rationality Zero, Guillen’s self-described science fiction espionage horror novella, and I’m happy to say that it’s no exception. While “science fiction espionage horror tale” might initially sound like there was an explosion at the genre factory, it’s a fitting label for an excellent combination: Cybernetically-augmented special forces agents with no memory of who they really are when they’re off duty; Rationality-bending “irrationals” whose existence threatens to break reality in Lovecraftian fashion; Artificial places hidden in side-pockets of space and time; Otherworldly horrors eager to break into our world, or to capture us in theirs. Guillen introduces us to this world–ostensibly our own, with secret terrors lurking on the edges–in a way that’s perfectly paced and through the eyes of Michael Bishop, an asset of a place known only as “The Facility.” From the moment he’s awakened from his off-duty life, both the reader and Michael are drawn into an experience that spirals further and further into a danger greater than Michael has ever experienced. As always, Guillen’s writing grips the reader with its palpable style and poetic edge. There were moments when it felt as if I couldn’t have stopped reading if my life depended on it, pulled by the intrigue of what might be next and driven by the horror of what had come before. 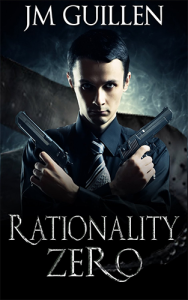 As it’s a novella, there are only few characters in Rationality Zero. Guillen constructs each in a way that makes them feel real (even as said characters are pulled into situations “outside” of their own reality). Furthermore, the setting is a character in itself, and a pleasure to explore. Seriously, I would love to play a Deus Ex-style computer RPG set in this world. It just works so well. My only nitpick is that there are a handful of brief spots when it felt like there was just a little bit too much detail in terms of the workings of the characters’ cybernetic augmentations, or their ways of measuring changes in reality. But understand, that really is a minor nitpick, especially as such situations only came about because I was so eager–and anxious–to find out what would happen next.